Internet is a horizontal media. Time for vertical trickle down of information, communication & governance is over. They desperately need a collective platform to shape a better society. 5 billion people periodically exercise their right to choose their representatives. If only they could collectively leverage this power in their constituency. fails to get around the differences of geography, culture & economy. 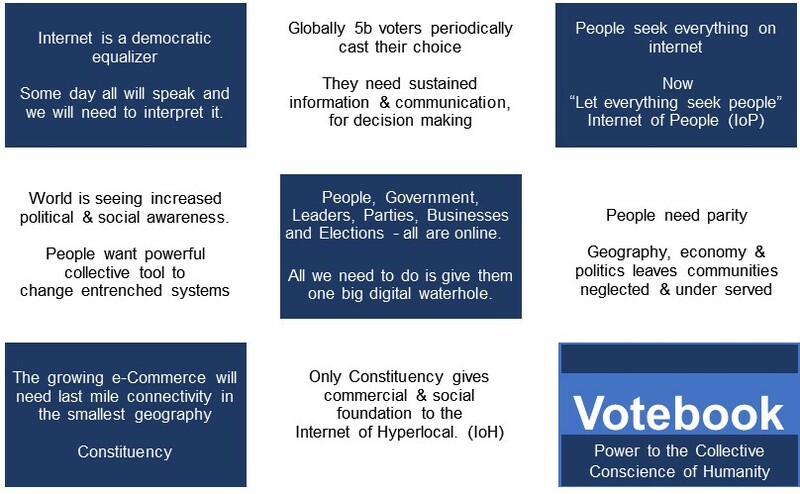 People, Government, Leaders, Parties, Businesses and Elections all are online. All they need is one digital waterhole. 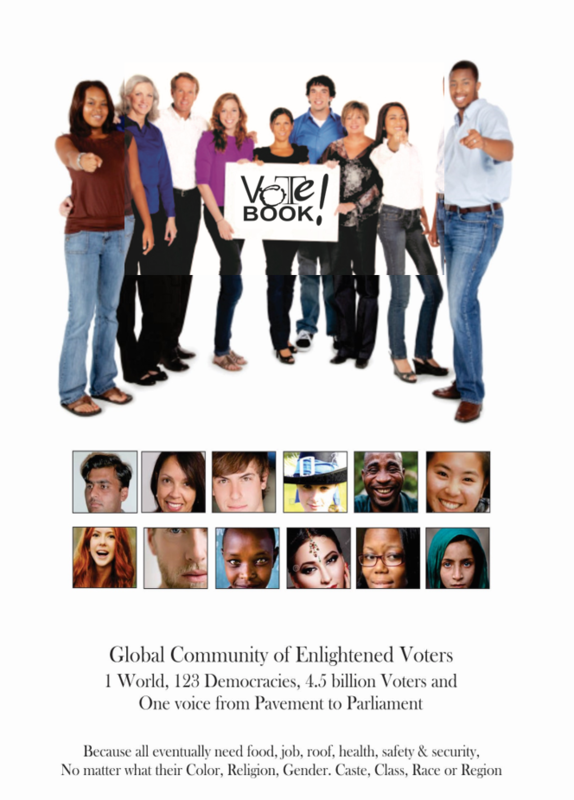 Votebook is an answer to the helplessness of ‘what my single vote can do’. It collectively empowers enlightened citizens to evaluate, compare, monitor, audit & complain to seek accountability & good governance, by leveraging their votes in the constituency. 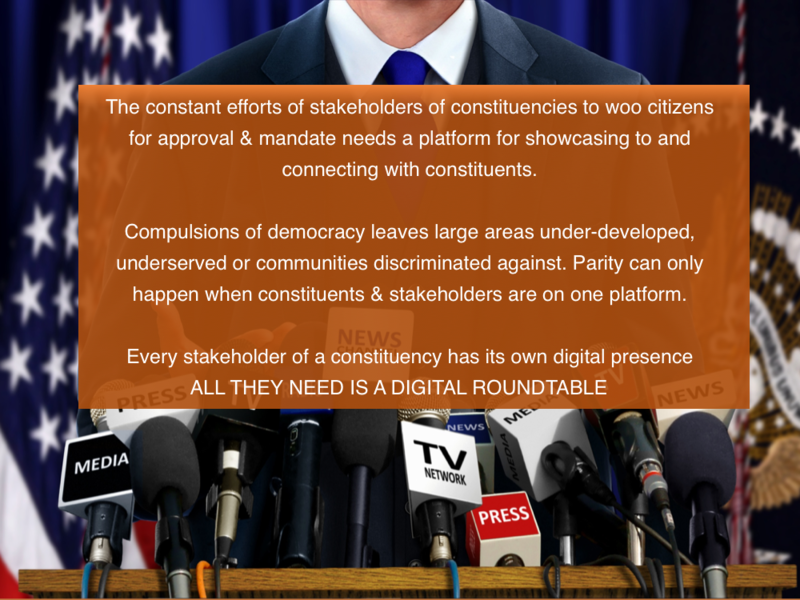 Virtual constituencies with networked voters induce positive competition among leaders & parties to be one up on rivals by showcasing themselves & addressing the concerns of the community to grow their reach and credibility. Consequently, this galvanizes service agencies & administration to perform. 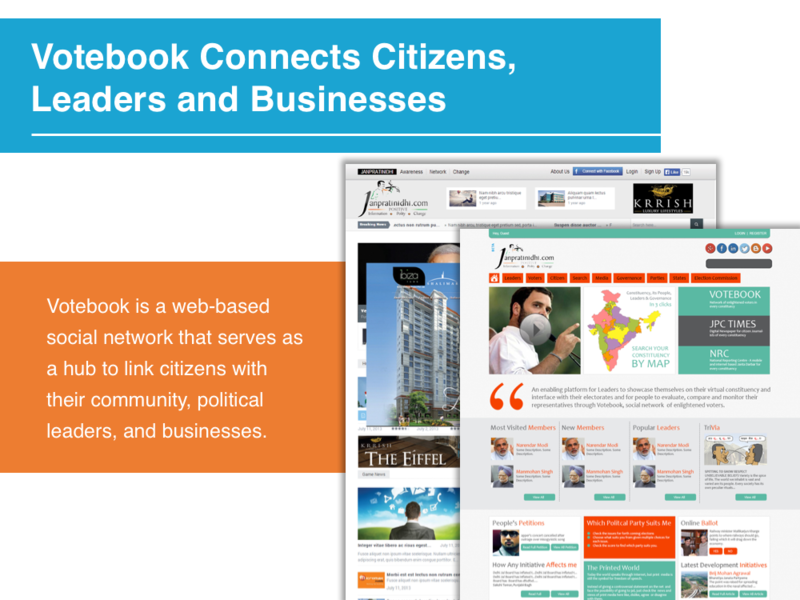 By bringing together engaged communities to share information, Votebook yields social, political and commercial dividends. 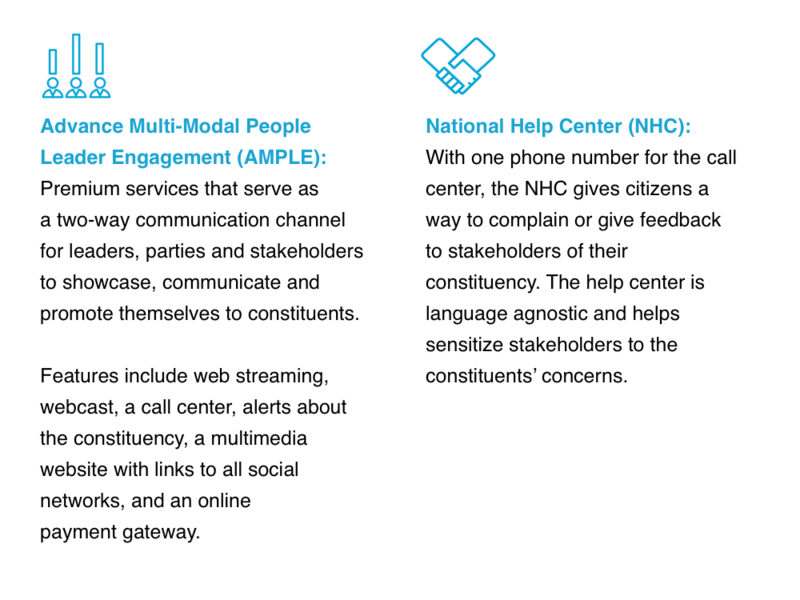 Digital Hubs of Constituencies from Panchayats to Parliament, County to Capitol. 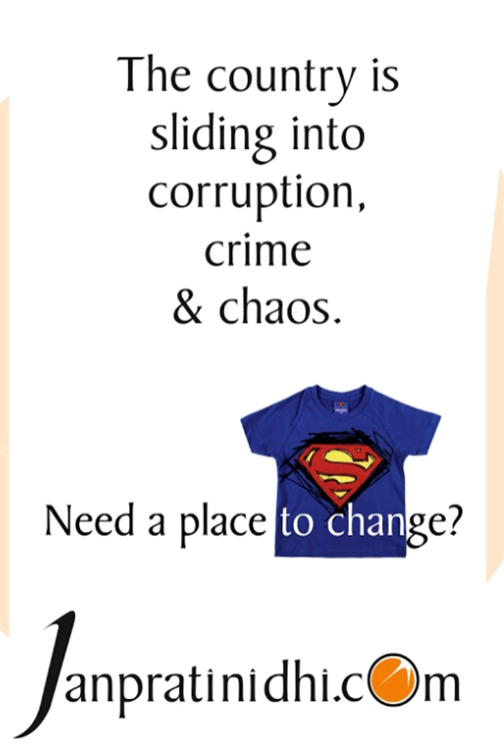 Voters, Leaders, Parties, Governments, Corporates, NGOs. Information; Network; Complaint; Audit; Evaluate/Compare/Monitor; Communication; etc. For every adult citizen in any democracy. Where internet comes to people. 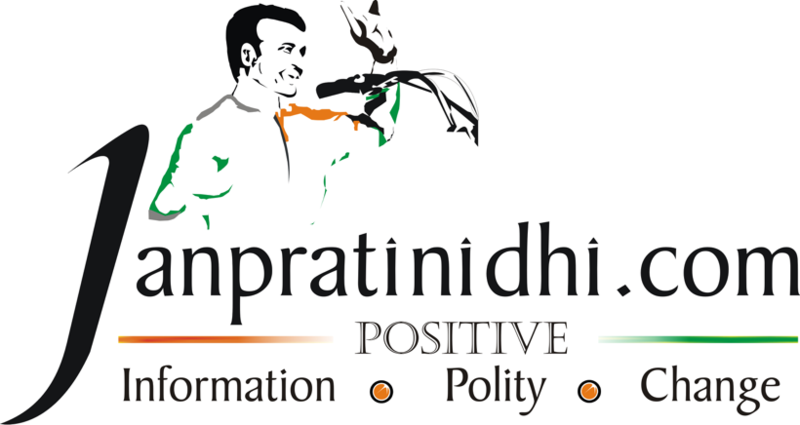 - Leaders - Showcase; Call center; Constituency, Election and Media management. - Parties - Showcase, Promotion, Cadre management. - Governments - Showcase, Promotion, Complaint Escalation Matrix, Feedback. - Advertisement - From local pop & mom store to Largest MNCs. - Subscription - Premium services to stakeholders with mobile convergence to all. 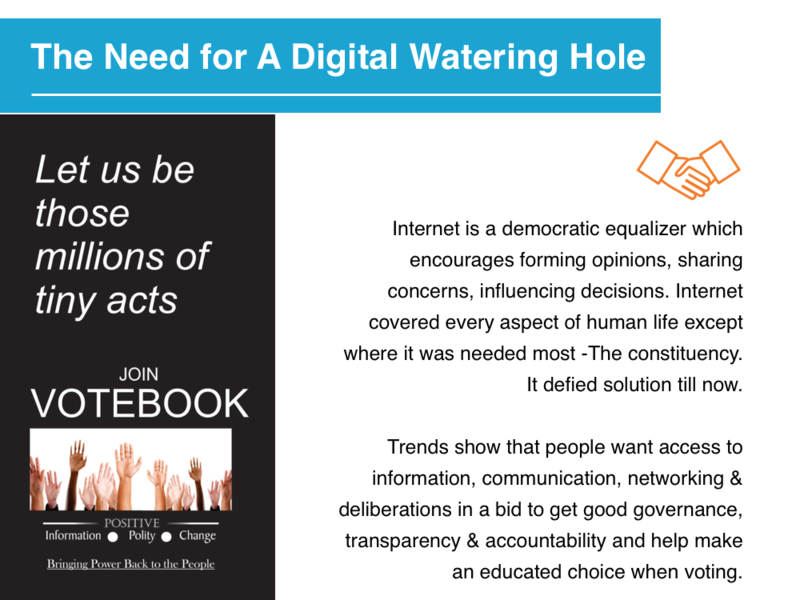 Votebook benefits from the interdependence of all stakeholders. 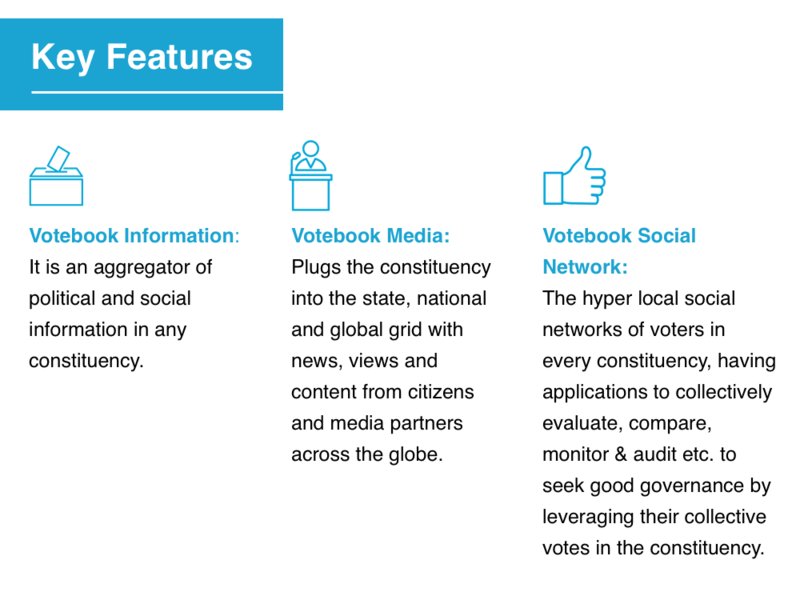 Votebook has the strongest and most powerful social foundation – Collectively leveraging people's votes to bring peace, prosperity, accountability, transparency and good governance. People - Are driven by the network’s ability to change the system. 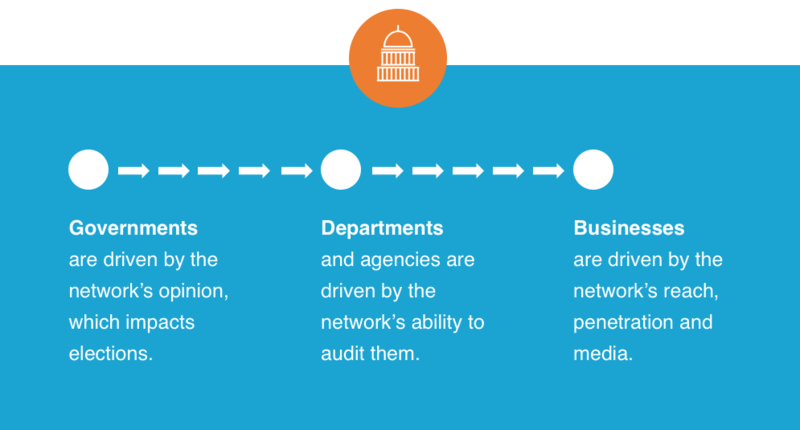 Network brings political power as it grows which brings more people to the fold. Leaders and political parties - are driven by the growing social network of voters and its ability to change their future. And also by the compulsion to claim the virtual constituency and stay one up against political rival. has been developed and tested and it serves as proof of concept. Patents/IP: The platform is a business-based idea that has been registered under the Copyright Act. 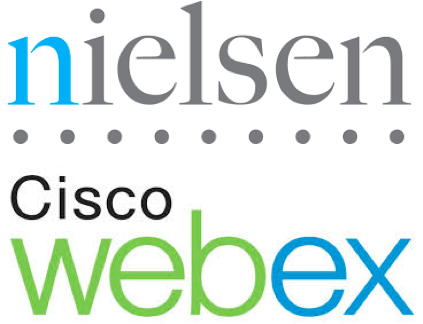 Partnerships: Nielsen entered a vendor agreement with us to provide facilities to our premium members. CISCO WebEx provides the entire spectrum of services for people-leader conferencing, including live streaming and web conferencing. Distribution: While test marketing our platform during the two-day International Franchise Exhibition in Delhi, we received about 1,000 serious enquiries for franchise in constituency for a fee. One national TV channel in India wanted exclusive rights to leaders using Votebook Premium Services as a condition to fund. Two regional parties showed interest to buy out the platform at its blueprint stage. CNRI a 7000 strong NGO confederation for Rural India has agreed to do a social outreach program in rural India for Votebook. This would be used in all developing economies. Election Commissioners of various democracies have found Votebook in line with their strict neutrality norms. 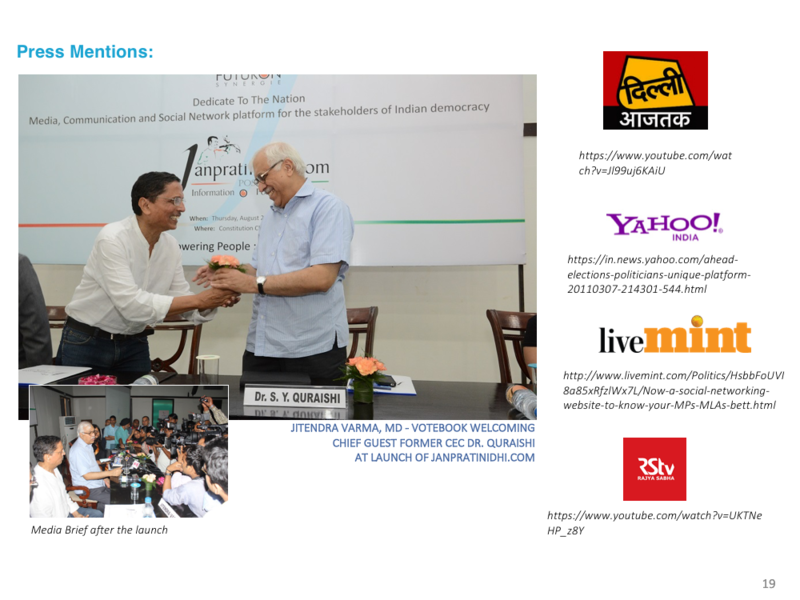 In fact, the Indian prototype of Votebook was launched by ex-Chief Election Commissioner of India Dr. S. Y. Quraishi. Web Presence: 40,600 pages from our site have been indexed by Google. Moving forward, our focus is to build our commercial model before GE 2019 for India & before 2020 for Presidential Elections in US. We will build a franchise network in all ACs of India as go to marketing strategy to market our services and products to stake-holders & advertisers. Platform’s proximity to power & the recession free business of elections will make VOTEBOOK an attractive business opportunity for its constituency franchisees. The franchise fee would help us in branding, take up social out reach programs and public relation campaigns to make it popular in India and expand abroad. Ranvir Singh Nayar is an Indian journalist who has over two decades of professional experience in various global media houses including CNBC, BBC, Ananda Bazar Patrika, Bennett Coleman and Indo-Asian News Service.